Osteoporosis, a bone disease resulting in the loss of bone density and microstructure quality, is often associated with fragility fractures, and the latter imposes a great burden on the patient and society. Although there are several different treatments available for osteoporosis such as hormone replacement therapy, bisphosphonates, Denosumab, and parathyroid hormone, some concerns have been raised regarding the inherent side effects of their long term use. It would be of great relevance to search for alternative natural compounds, which could complementarily overcome the limitations of the currently available therapy. Herein, we review current literature on natural compounds that might have therapeutic values for osteoporosis. Search terms included bone resorption, bone density, osteoporosis, postmenopausal, osteoporosis or bone density conservation agents, and any of the terms related to traditional, herbal, natural therapy, natural health, diet, or phytoestrogens. All the compounds and herbs included in the review are naturally bioactive or are used in folk herbal medicine and have been reported to be capable of attenuating osteopenia or osteoporosis in vivo or in vitro, through various mechanisms – estrogen-like activity, antioxidant and anti-inflammatory properties, or by modulating the key signaling pathways in the pathogenesis of osteoporosis. Through our assessment of the therapeutic potential and outlook of alternative medicine, we aim to provide an appealing perspective for the consideration of the application of a complementary anti-osteoporotic treatment option and prevention strategy for osteoporosis or osteolytic bone disorders. Keywords: Herbal medicine, natural compounds, osteoblast, osteoclast, osteoporosis, postmenopausal osteoporosis. Keywords:Herbal medicine, natural compounds, osteoblast, osteoclast, osteoporosis, postmenopausal osteoporosis. Abstract:Osteoporosis, a bone disease resulting in the loss of bone density and microstructure quality, is often associated with fragility fractures, and the latter imposes a great burden on the patient and society. Although there are several different treatments available for osteoporosis such as hormone replacement therapy, bisphosphonates, Denosumab, and parathyroid hormone, some concerns have been raised regarding the inherent side effects of their long term use. It would be of great relevance to search for alternative natural compounds, which could complementarily overcome the limitations of the currently available therapy. Herein, we review current literature on natural compounds that might have therapeutic values for osteoporosis. Search terms included bone resorption, bone density, osteoporosis, postmenopausal, osteoporosis or bone density conservation agents, and any of the terms related to traditional, herbal, natural therapy, natural health, diet, or phytoestrogens. 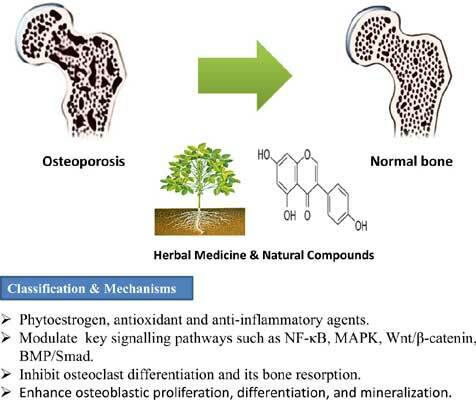 All the compounds and herbs included in the review are naturally bioactive or are used in folk herbal medicine and have been reported to be capable of attenuating osteopenia or osteoporosis in vivo or in vitro, through various mechanisms – estrogen-like activity, antioxidant and anti-inflammatory properties, or by modulating the key signaling pathways in the pathogenesis of osteoporosis. Through our assessment of the therapeutic potential and outlook of alternative medicine, we aim to provide an appealing perspective for the consideration of the application of a complementary anti-osteoporotic treatment option and prevention strategy for osteoporosis or osteolytic bone disorders.